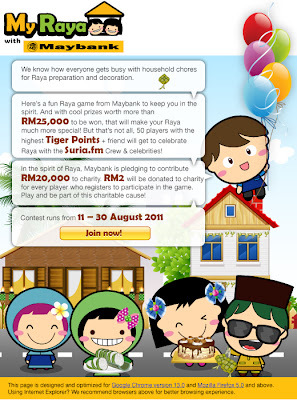 50 players with the highest Tiger Points + friend will get to celebrate Raya with the Suria.fm crew & celebrities! Play the online game & earn "Tiger Points" to be in the running to win prizes! Visit Maybank's Facebook fan page for more detail. Jemput Aznil ke rumah korang! MASiF happening on Malaysia Day?